I've not had as much time to comment, so I hope my Battle buddies forgive the brevity. Go check out their blogs to see how it is REALLY done, eh? They're awesome and a hoot to visit. as I revisit some of the movies I love to love, love to hate, make me quake with fear, burst into song or just make me laugh when I see them. It's a mute-free extravaganza! Join ALL of us (and brother, there is quite a few participants...YOU should be one, too). I'm on it! Thanks, Birgit. Poor Alicia. I think in the writing world, that's the equivalent of writing a book where the movie they end up making actually turns out way better. Bring on the A to Z! I'd love to learn some more great character lines. The quotable kind, especially. I hear ya! (No "Snakes on a Plane" this round, right?). Poor Alicia. Adam just did it better, IMO. Your A to Z sounds like a fun one, I'll try to check in every so often. Thanks, FAE! I'm doing my best to jump start my blog karma at the same time. Wow! That was unexpected but he did a fine job! Yeah. I'm a bit surprised. Though I voted for Alicia, so I should have expected her to lose. Bwahahahaha. It feels that way sometimes, doesn't it? Interesting theme. Good luck with the challenge. Some of AL songs I love, but I wouldn't say he got a thumbs up across the board. Thanks, DD! Finally chose a winner here! Your A to Z sounds fun!!! BAM. You did it. I never doubted you. Could have gone either way and I'd still like it. This is proving to be a fun challenge. I vote for Adam. Yeah, that's pretty bad when somebody beats you over the head with your own song! Looking forward to your A2Z posts, Sister. Don't worry, if you get any of them wrong, I'll gently correct you. And if you get them right, well... "you're a daisy if you do." IF I need help, you know who I'm calling (Ghostbusters?). Ooh, this sounds good. Have fun this year! I'll be quoting right along with you! Such an awesome theme. It's a virtual quote-off! Come on, Alex, let's do it! Man, I feel terrible. This is another battle I somehow missed. I thought I made sure to visit everyone, but I missed two entire battles. Well, I apologize. 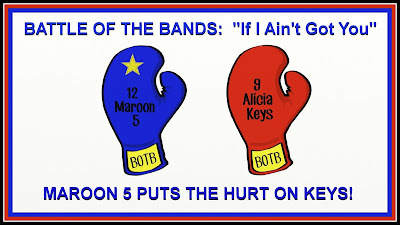 I did listen to both songs, and I would have gone with Maroon 5, so my vote wouldn't have changed much. As for the theme, I love it. I love to quote films, and can't wait to hear what some of yours are. "I'll be back" - Arnold Schwarzenegger. I think you may have the same problem I do: time zones! You check a few times and they aren't up yet, then you miss them. And I've been late a few times. No apologies necessary - you're here now, brother! I talked to Alicia this morning and she read your blog but was too upset to comment. Looks like a fun A to Z theme ahead. Listen, Alicia has to put on the proverbial big girl pants on this one, Arlee, ha ha. Thanks, Lori! See you there! I picked a winner here. Looks like your A-Z will be more funner than ever! I anticipate a few hoots, Dixie! I do love a ridiculous line...or a deep, thought provoking one. Why wouldn't Alicia Keys follow you? Yoko Ono is your best friend. You're the most famous person who follows me, and I wuv you for it. Why wouldn't she? I'm still asking myself. Yoko appreciate my John-loyalty. Correction: I'm the least famous person who follows you. The "wuv" part is reciprocated! My Music and Awards post is up. Thanks again for nominating me! You're welcome! I've read a bunch but haven't commented yet (I've been reading on my phone...a true pain to use for comments). My favorite lines are repeated by my family OFTEN. Oh, my! I'd have a terrible time trying to remember all my favs! I'd constantly be changing my mind and would never get finished. More power to you! Lining them up now, just to make sure I can fill the bill! Woot! This will be fun. If you'd like a gift copy, please email me. I'm happy to provide. I'd love a copy! Thanks and best of luck to you on your book! I have too many favorites but my bad memory keeps me getting confused about whose lines are which. Good luck with the A to Z Challenge 2016. I hear ya, sister. My memory is slipping a bit, but it may be an overtaxed schedule. Looking forward to the A-to-Z! Maybe! That would be great. Love the "cat-herder" moniker. Have you ever seen Begin Again? It's about a songwriter and a washed up record producer. Adam is in that movie and he sings. He is really good. Alicia Keys reading your blog wouldn't be bad at all. I just hope Barack Obama doesn't read MINE. Oh, if only he would...that would make my day...and month...and year. That is, if I survived the huge guffaw I would produce. Right back at you, my friend! Love and hugs. I fear some will just be "inside jokes" with my family, ha ha. Your theme sounds very inspirational! I'm curious if any of your favs will match up with my own. Awesome! I need to follow the "pros" at A-to-Z to learn how to really do it right. Jumping over to your site! Thanks! Film quotes - great idea! All I know is "I cudda been a contender," so I'll learn something. Hope you'll stop by my Women in the 1930s theme. It looks like this is your first a-to-z - mine too.